Deep Learning is really starting to establish itself as a major new tool in visual effects. Currently the tools are still in their infancy but they are changing the way visual effects can be approached. Instead of a pipeline consisting of modelling, texturing, lighting and rendering, these new approaches are hallucinating or plausibly creating imagery that is based on training data sets. Machine Learning, the superset of Deep Learning and similar approaches have had great success in image classification, image recognition and image synthesis. At fxguide we covered Synthesia in the UK, a company born out of research first published as Face2Face. Synthesia are seeking to address existing production problems in language dubbing and ADR. 'Native dubbing' is their new method of translating video content that utilises AI or Machine Learning to synchronise the lip movements of an actor to a new dialogue track by a different actor. The President of the People's Republic of China, Xi Jinping singing 'Imagine'. Now a new company has emerged aimed at a similar market but with a different technical implementation. Canny AI is launching their VDR™(Video Dialogue Replacement) process to replace the dialogue in any footage. 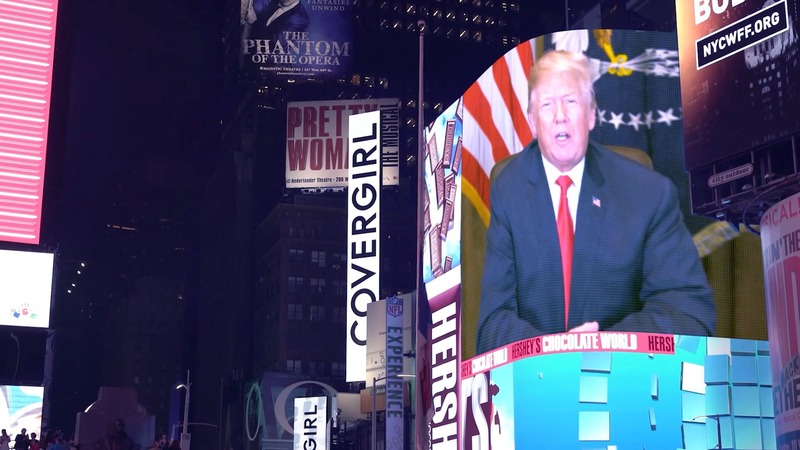 To demonstrate the approach, they released the video above which shows world leaders singing to John Lennon's ‘Imagine’. 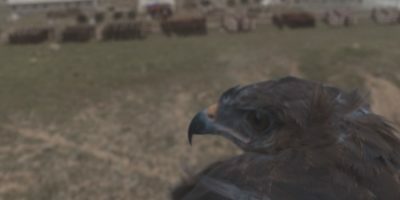 Above is the original University of Washington video, which demonstrates their tool developed by computer vision researchers, led by Supasorn Suwajanakorn, to create realistic video from audio files alone. In this example above, the team created realistic videos of Obama speaking in the White House, using the audio file from a television talk show and from an interview recorded decades ago. The paper was presented at SIGGRAPH 2017. The team chose Obama because the machine learning technique needs available video of the person to learn from, and there were hours of presidential videos in the public domain. For this video, Suwajanakorn used 14 hours of Obama footage. This approach used a recurrent neural network to convert audio into key mouth shapes (a sparse set of shape coefficients). They then synthesized the texture, enhanced details such as the teeth, and composited the new mouth onto the head and background of the source video. This is a highly complex problem as often your mouth moves before you actually say a word, so it’s not enough to condition the mouth shape on 'past' audio input – the neural network needs to look into the future. Parts 1 and 3 come from the synthesized texture, while parts 2 and 4 come from the target frame. 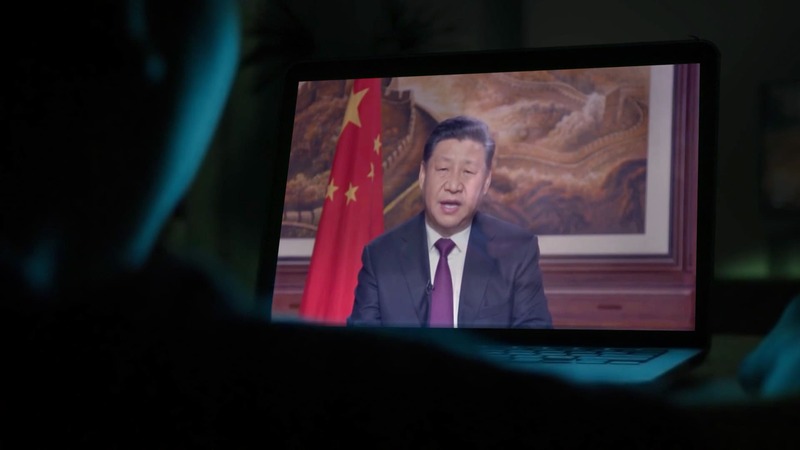 The Canny AI team also saw Face2Face: Real-time Face Capture and Reenactment of RGB Videos, which was another landmark development in face replacement technology. This was first shown in the Emerging Tech Hall at SIGGRAPH 2016, but at that time, “Face2Face wasn't very accurate in terms of the lip sync. So we saw potential in improving that area,” commented Ben-Ami. Face2Face's Prof. Matthias Niessner would go on to form Synthesia. To promote Canny AI's VDR approach, the team have released a video (top of the story).The video was made purely as a demonstration, but with the hope that it would imply a positive message that this general style of AI processing need not be associated only with the ethical issues surrounding 'Deep Fakes'. 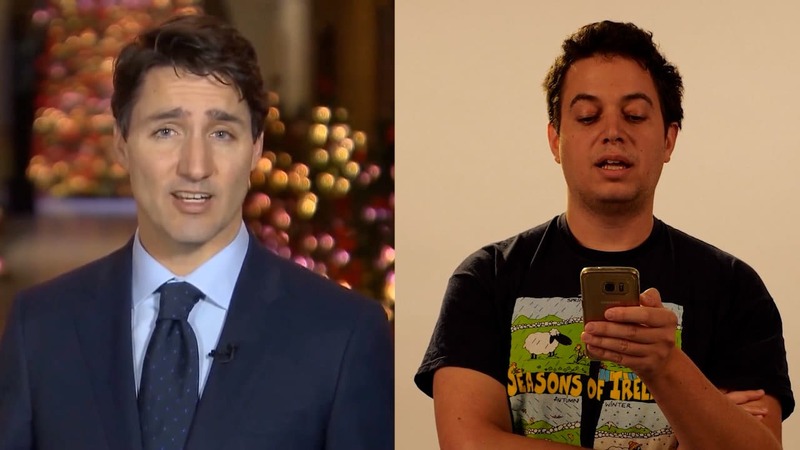 VIDEO: The source that drove the lips of Kim Jong-un or Justin Trudeau: “That would be me,” exclaims Jonathan Heimann, "That would be me singing or lip syncing ‘Imagine’, very badly!" (see above). The ‘Imagine’ video was made using stock footage clips from a stock library for the 'global audiences'. These clips had the treated video composited into them using traditional methods. Israeli studio The Hive donated their time and resources to do the compositing and editing of the final song. 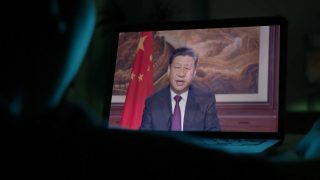 The Canny AI team produced long clips of the various world leaders singing most of the song, and then the editors decided which leader would work for which part of the edit. In reality, a lot more material was generated than was needed. This reflects the fact that training the network takes time, but once it is working, the actual process is very quick. In fact, speaking in rough terms, if a 30 minute training video wanted to be converted to another language, the team estimate they could easily turn it around in a couple of days, assuming the same presenter is used throughout. The company is now taking on projects actively, bidding jobs and doing key tests for some major potential clients. At the moment they are leaving aside the issue of occlusion, assuming more traditional methods will provide the solution to these special cases. To solve the lighting, the process works scene by scene, adjusting for each. For temporal flicker, the team worked long and hard to develop special IP that addresses this issue. 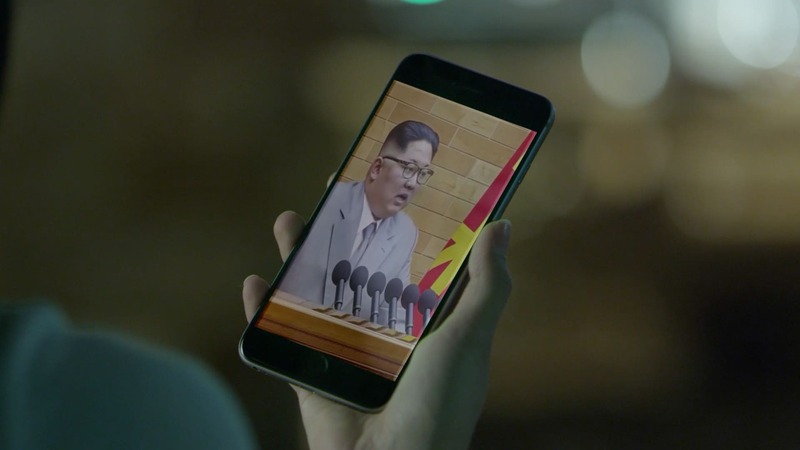 Their results don't flicker and in fact, in the sample video, there was no special post production or visual effects done on the imagery of the leaders, themselves. While the whole frame may have been composited into various stock footage shots, the actual singing clip is as it came out of the process, and was not separately treated in AE, Flame or Nuke. For Canny AI, the target is very high quality lip sync and no post processing to hide flicker or glitches. The company is only two people right now, Omer Ben-Ami and Jonathan Heimann, but they have two key advisors: Dr. Uri Shaham and Michael Hamilton. "It's the two of us and we have two advisors. One of them did their PhD at Yale in Statistics and the other one is from the movie industry. He works in audio post production in business development," explains Ben-Ami. The technology works of course both ways. 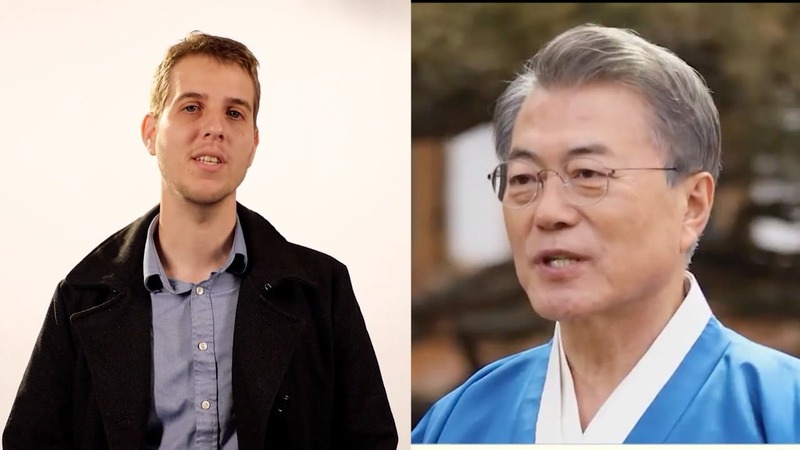 Above is the South Korean president, Moon Jae-in. What is significant in the test above is the use of footage from different angles, and the robustness of the system to the angle of the source video, as seen here.